Customer Carrie N. was looking for a special gift for her sister ~ her sister who may be the world’s biggest Pearl Jam fan. First row seats at multiple concerts every tour biggest Pearl Jam fan. My suggestion? A quilted backpack. Carrie liked that idea because her sister did a LOT of waiting in lines for those exclusive tickets. Want that kind of response to the gifts you give? 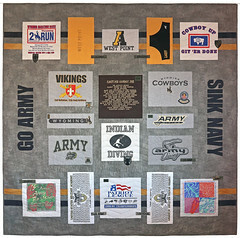 Contact Whimzie Quiltz and let’s get a special gift for your loved one started! I don’t make a lot of modern quilts, but the bright pastels of Michael’s frozen yogurt paradise called out for a contemporary quilt design. The overall pattern here was inspired by a layout in Amy Gibson’s The Quilt Block Cookbook, mixed with appliques representing each main character. Of course, I had to add the original, happy green “Welcome. 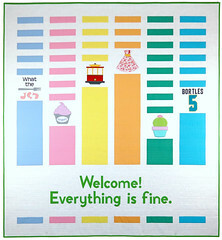 Everything is fine.” greeting, too! 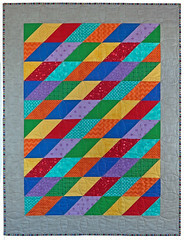 When it came time to quilt the top, I stayed with the modern vibe, using mostly straight lines and pebbles. The initial lines went from side to side; once I’d covered the entire top, I removed it and turned the quilt 90 degrees before putting it back on the longarm to add straight lines from top to bottom. This was the first time I took a quilt off the longarm mid-project and am pretty pleased with how it turned out. I do think, though, that had the initial quilting not been as dense as it was (the lines were 1/2″ apart) the mid-project removal might not have worked as well as it did. While I’d like to think that creating this motherforking awesome quilt should itself be enough to get me into the real Good Place, I may have lost some points because of how long it took me to finish. Still, it’s not like I used Facebook as a verb (-5.55 points) or rooted for the New York Yankees (-99.15), so maybe I can curl up with this quilt in the Medium Place if nothing else! In July, Sheryl M. contacted me about a Pittsburgh Steelers custom quilted checkers game. Seems that she works in a nursing home in Pennsylvania and thought the residents would enjoy playing. They must have ~ because in August she contacted me to have a second Steelers checkerboard made! 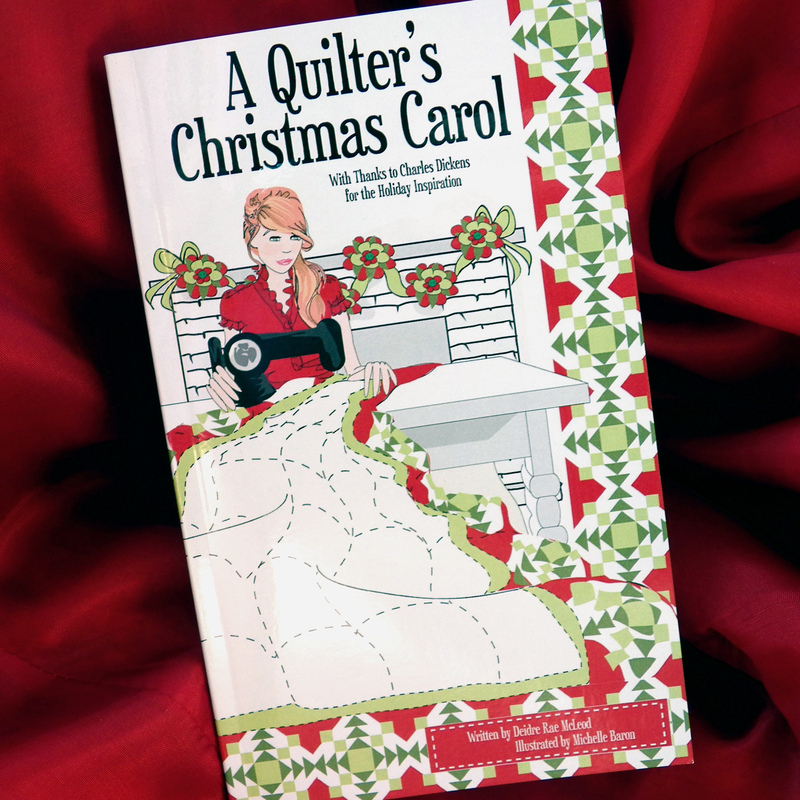 After finding me through the Whimzie Quiltz website, most returning customers contact me directly for new projects. So it was extra fun to just see 4x customer Gus H.’s name pop up on an Etsy store order in August for this Hello Kitty custom quilted checkerboard game. Glad he knew that, no matter how someone gets in touch ~ directly, through the website, through Etsy or Facebook ~ it’ll be the same great Whimzie Quiltz experience no matter what! In 2014, I made a no soliciting sign, a no trespassing sign and two pillows ~ all quilted ~ for our home. This year, the constant sun, wind and dew exposure finally did them in. So this is the new set (the pillows aren’t pictured). I figure I have until 2022 – unless we move 😀 – before I have to do it again.